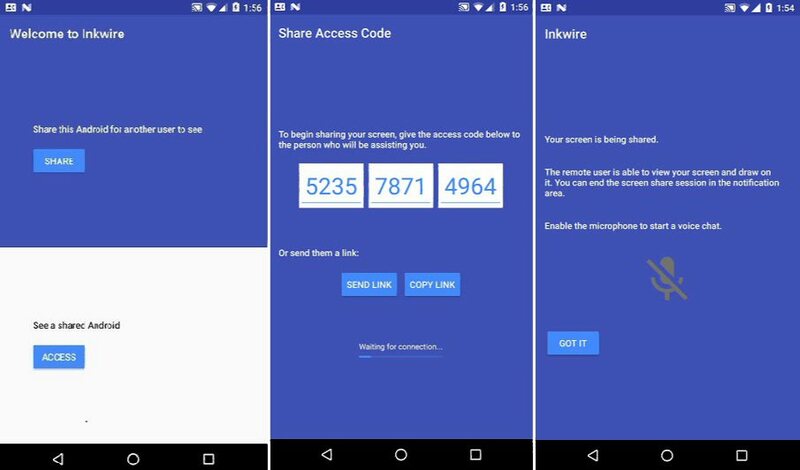 Upcoming Inkwire app will offer easy Android-to-Android screen sharing with Voice chat. To use the app both users will need to install the app. One of those users will need a code generated by other users phone. After the input of right codes user will able to access the other device. Unlike Vysor, Inkwire doesn’t require ADB or a computer. Just plain old Android to Android screen sharing, without the cords. Since ADB is required to send the touch and keyboard events, Inkwire can’t do that. I’m working around this by drawing over the screen to show the remote user where to touch; the experience is still pretty good. Also, has built in voice chat.